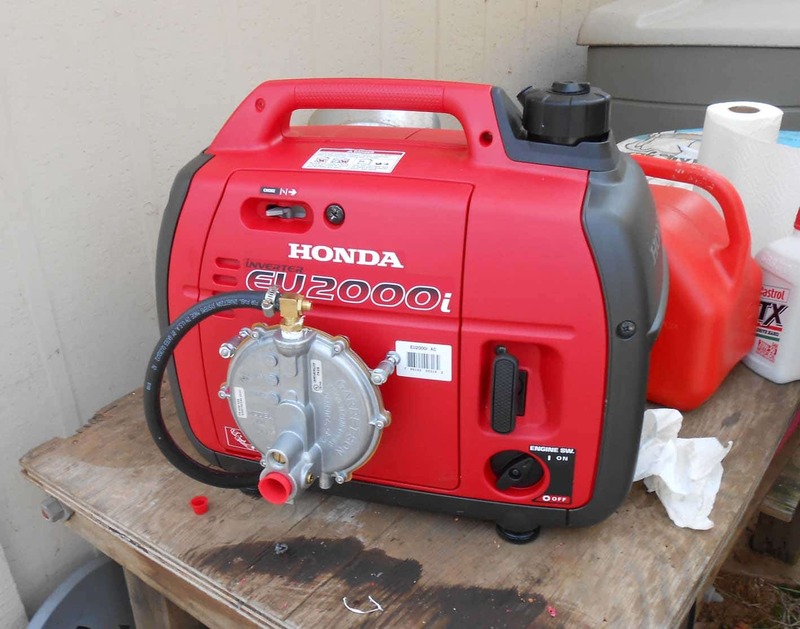 Yesterday I spent about an hour and half converting a Honda Eu2000 generator to tri fuel (runs on natural gas, propane or gasoline). A while back, I had ordered a conversion kit from Central Maine Diesel. The kits cost about $179.00 plus a core charge unless you send them your carburetor. In my case since the generator was new and had barely been run I decided to pay the core charge and keep the carburetor for a spare. I am not a mechanic and the instructions were not the best. They consisted of 3 or 4 pictures with a few notes. A friend helped me and we found it surprisingly easy to complete. The Honda is a dream to work on and we only had to remove two nuts and a bolt to remove the carburetor. The hardest thing was organizing all the hoses. 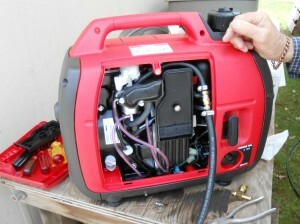 We did have to drill holes in the generators outside case to mount the regulator and run the hose to it. Here is the finished generator. Upon completion, the generator fired right up. It runs beautifully. In an emergency, this greatly expands the availability of fuels. If any of you are thinking of making this conversion, I would not hesitate to recommend you do it yourself. It is cheaper than having someone else do it. There are several brands of kits for sale on the internet; the only one I have had any experience with is the one from Central Maine Diesel. I can recommend it because I know it works. Warning they are very backlogged and if you want one get your order in early. This entry was posted in equipment, fuels and tagged generator, Howard, Tri Fuel Generator. Bookmark the permalink. Good information. Here’s my problem with the whole generator concept. If you live on the Gulf coast and want to prepare for the inevitable hurricane then all well and good. But for most people the intent is to survive SHTF. So how long are you going to run your generator to keep your freezer going? Where will you get the gas? It isn’t practical. I have a motorhome with a nice commercial quality generator in it which I never use. I do start it up every month or so to make sure it’s still running and clean the old gas out. After all someday I will sell or trade in the motorhome and I don’t want the generator to be a deal breaker. What I use instead is a minimal solar (PV) system (45 watts harbor frieght panels) to charge my aux batteries and I use a couple of small solar charged garden lights to provide lighting at night for reading and other after dark needs. My $5 garden light runs for 8 hours on a charge and I can read by it or play cards etc. I think the same model will work fine for SHTF. It does not make sense to plan to use a generator. Photovoltaic panels producing current of from 1-1/2% to 5% of battery bank capacity are sufficient to compensate for self-discharge in storage batteries and can maintain them on “float” almost indefinitely. No charge controller is required as long as maximum charging current doesn’t reach the threshold needed to cause evaporation of electrolyte after full charge is reached. A Shotky diode is wired in series with the panel to prevent battery discharge at night when panel voltage drops below battery voltage. This method of float charging is very commonly used in industry and agriculture for storing seasonal vehicles or equipment which are not used at least monthly. Additional panels may be added to the system to replace energy consumed daily by working loads and to compensate for energy used by charge controllers, etc. To avoid over-charging the batteries during periods of non-use, a charge controller is used to disconnect the panels from the batteries once they reach a fully charged state. While voltage is nearly constant, the charging current produced is dependent upon incident light in watts per square meter under normal operating conditions. Under ideal laboratory conditions (full sun perpendicular to the panel in clear sky at 20 degs. C) this figure is about 800w/m2. A 50w panel therefore produces 1,500+watt /hours of energy weekly under full sun or more under theoretical “ideal” conditions, but more realistically will produce only a fourth as much during a typical, cloudy mid-Atlantic winter. To properly size a photovoltaic system adequate to operate continuously, total all running loads in watts, multiply by the average daily use in hours, plus a 30% allowance for DC line losses. Subtract any average daily energy produced by back-up generators and divide the total by the product of the module power rating times the “Area Factor” which compensates for local sun conditions (4 is the figure used in the mid-Atlantic states) to yield the number of panels required. A 200-watt solar system floating four L16 flooded lead-acid gold cart batteries is adequate to power continuously a 200-watt HF-SSB radio, antenna coupler, 25 watt VHF marine, airband or 2 meter ham radio, laptop computer, terminal node controller and sound card interface for the radios, plus a small refrigerator, small RV type air conditioner, and emergency lighting for an incident command post. It would also provide spartan, but adequate backup for a vacation home or small house, or to permit running a small group of “medically essential appliances,” such as CPAP, refrigerator-freezer for perishable food and medication, and invalid room air conditioning unit, probably not all at once, but in a calculated “rotation” in a larger house. Havіng read this I belіeved it ωas extгemely enlightening. I apρreciate you spending some tіme and energy to put this сontent together. I onсе again find mysеlf pеrsοnally ѕρending wаy too much time both readіng and leavіng comments. I just sent mine back. NO SERVICE! If they had better instructions they probably would have time to talk to customers. It took 7 weeks to get the product after I ordered it. I left four messages asking them to call me for help in getting my Honda Eu3000is working an they never once returned my call. When I called an actually got someone usually a 10-20 minute wait they blamed it on everything but their product. When I called them yesterday (Wednesday) they told me they didn’t return my call from Monday because they were to busy taking care of customers…..that’s when I sent mine back. I have two honda eu2000 gens running in parallel, both converted using Maine Diesels conversion kits. Prior to this week over last year and a half, maybe 1-2 hours of use ever, and never with a drop of gas, only propane. We had a power outage 3 days ago, pulled the gens out and they started right up after minimal attempts. They ran smoothly for the 24 hours needed, minus sleep hours, and much fuel remains in the grill size propane tanks. Yes the instructions were sparse, when I called it took about two calls to connect with the guy responsible for putting the kits together. He was very helpful, sent me a couple requested extras and I was up and running. Yes, the service could be a bit more attentive and the instructions / problem solving more detailed. I have an onan-cj generator 4 cylinder 18 kw 1800 rpm 3ph. that I’m interested in converting to propane, can you help?